Ever heard of toxic relationships? Noncommittal friendships are similar, but somehow on different sides of the spectrum of friendship. The thing about non-committal friendships is that recently, I've been trying to figure out whether or not they're important to hang onto or let go. 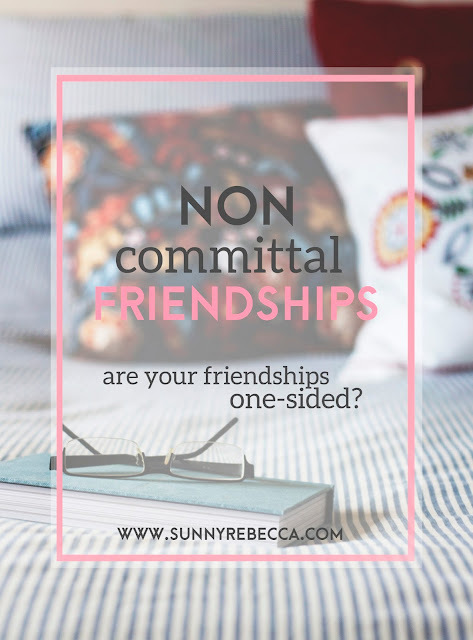 So what are non-committal friendships? I'm not positive whether or not there's another term for this, but this is what I call when it seems like friendships are one sided. Let's clarify things before we get started on my rant about noncommittal friendships. By doing that, we're outlining the spectrum of friendships, since there's definitely lots of different levels of friendships that can apply. Frenemies: Frenemies are the people that you act like you like, act polite to, smile, but all of that is fake. In reality, you don't like this person one bit and neither does the other. And both of you know it. However, you still act civilized around them, but in your mind, you're secretly trying to plan an escape route to avoid them. Toxic friends: These people are the kinds of people that you think you're friends with and maybe they think you're friends with too, but secretly, the relationship is emotionally straining. Maybe this friend is selfish and expects way too much from you and gives you nothing in return. Or maybe they say things that they think are jokes, but actually hurt your feelings? Toxic friendships are basically people that you say that you're friends with, but most of the time, you don't really like spending time with. However, at the same time, you're scared to let go. Acquaintances: Acquaintances are generally people that you know the name of and would maybe smile or say hello to if you ran into them in public. (AKA out of classes or wherever you knew for sure that you would see them at) If you saw them at Kroger, you wouldn't hide behind a stack of bread to avoid them. Filler friends: These are the people that I like to call your "last resort." In a lot of social situations, we get scared to stand around and be alone. We think that we would look like a "loser" or that we have no friends if we weren't surrounded by people. Filler friends are the kinds of people that you don't necessary like spending time with that much, but you still decently like them. You have their phone number, but you would never text them unless you needed something from them. You would only spend time with them if you didn't have your close friends around. Non-committal friendships: These friendships are very similar to filler friends, but they're the people that in a way, pretend to be your friends. They love chatting it up with you in group chats and taking cute dog filter Snapchats with you, but their love only extends so far. When it comes to spending time with you, especially one-on-one, they flake out. They would rather wait for something better to come around, but at the same time they act like you and them are super close. There are times that you have with them that make you remember why you're friends in the first place, but when things get difficult, they don't have your back. It's a friendship that feels like work. You have to initiate conversations with them, suggest to make plans, step out of your way to help them, and it feels like you get little in return. Friends: This is where most relationships fall, since finding best friends aren't always as easy as you think. The general friend would be the person that you would spend one-on-one time with and text them with silly life updates. You would gather with them at parties when everyone grouped off, but you wouldn't spend every second with this person. You love spending time with these people, but they don't quite yet classify as a best friend. Besties: I think that this definition doesn't really need to be defined on too much. Basically, this person is the person that you would do anything for and would always hang out with (assuming that you had time and your calendar was open). Toxic vs. Non-committal Friendships: What's the Difference? Now that things are nice and clarified, you can get the idea of what kind of people non-committed friends are. So how are non-committal friendships like toxic friendships if they're on different sides of the spectrum? The thing about non-committal friendships is that they tend to have the pendulum effect. One day, it feels like they're great friends and you remember why you became friends. In the moment, all your doubts about them fade away and you feel bad for ever having those doubts. However, the next day, they do something that is a bit questionable. Maybe they ditch you when you make plans with them because something better came along. Maybe they didn't show up in the moment that you needed them. Whatever happened, something comes along that makes you wonder if they are actually a toxic friend. So how can you differentiate the difference between a non-committal friend and a toxic friend? The line is blurry, because in all honestly, I'm not quite sure what the difference is myself. The main difference between a toxic friend and a non-committal friend is that for toxic friends, you feel like they're constantly hurting you, except for some rare occasions. When you need them, you don't really expect them to be there at all. Either that, or you rarely need their help and they constantly need yours. On the other hand, a non-committal friend will be there 50% of the time, but you can't always count on them. If you need them, there's a possibility that they might be there for you, but you can't guarantee it. You usually don't lean on toxic friends because you know that they won't come through, whereas for uncommitted friends, you sometimes lean on them and they sometimes let you down. The key words that differentiate them are "most of the time" and "sometimes." Toxic friends aren't dependable most of the time, but uncommitted friends can sometimes be dependable. In addition, toxic friends generally hurt you, but uncommitted friends let you down. Non-committed friends are kind of like the weather. There are some days that are sunny and happy and others that are stormy and gray. Toxic friends are more straining, where you see more bad days than good. Are uncommitted friends worth keeping? There's one last thing that we need to address that I too have been wondering. If these friends are so uncommitted, then why are they still my friends? You see, these non-committal friendships are most of the time, easy friendships. They're not really what you would call, emotionally straining, it just feels like they don't care about you as much as you would like them to. I have quite a few friends that could fall under the category of non-committal friends because they never put in any effort to connect with me. This is especially true for people that I haven't seen in a while, they'll tell me how badly they want to keep in touch, but when I try to connect with them or make plans to catch up, they either flake on me or they just don't reply at all to my text messages. What drives me mad about non-committal friendships is their lack of reciprocated feelings. Friendships are defined as mutual bonds of affection between people, the key word being mutual. Friendships are just like relationships with significant others, you have to put in a little effort to make things not just about you, but about the other person as well. If only one person is putting effort into a friendship, could it really be classified as one? If the friendship is to work, both have to put in effort in order to reap the benefits. Friendships are teamwork. If your teammate in a two-person team is down, then how are you two ever going to win? The lack of effort from the other person is what makes me consider whether the relationship is beyond repair. As I put in effort to try and save the relationship and the other doesn't, then who is to say that it will ever get repaired. So is it worth hanging onto these friendships or should they be cut loose? These friendships are somewhere in-between salvageable and beyond repair, but you're not quite sure which one it's leaning towards. There are days that I feel like non-committal friendships can be repaired, but every time I try, I remember why I wasn't able to classify them as a general friend, but as a non-committal friend. Maybe I'll send out a text asking to meet up and they'll agree. However, most of these times that I've "extended an olive branch," have ended up in them flaking on me when we start discussing specifics. I'm absolutely okay if they happen to be busy, but the true test of whether or not someone is a committed friend is if they try to arrange to meet up on a different day. The majority of reactions I get from these non-committed friends is either "I'm busy" and then no further attempts to connect or they don't reply at all, which is basically ten times worse. While I would like to give a straight answer to help you out in any situations with your non-committal friendships, I'm still trying to figure it out myself. So what do you think? Are non-committal friendships worth hanging onto or are they beyond repair? I really liked this article. Very informative and good know about this terms.